Single-incision laparoscopic surgery poses significant ergonomic limitations. Curved instruments have been developed in order to address the issue of lack of triangulation. 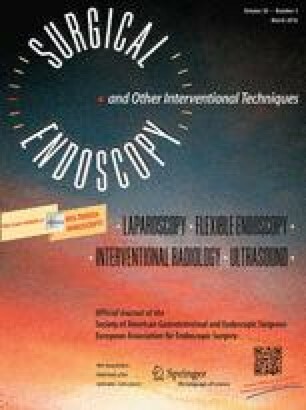 Direct comparison between single-incision laparoscopic surgeries with conventional linear and curved instruments has not been performed to date. MEDLINE, CENTRAL and OpenGrey were searched to identify relevant randomized trials. A network meta-analysis was applied to compare operative risks, conversion, duration of surgery and the need for placement of an adjunct trocar in single-incision laparoscopic cholecystectomy with linear and curved instruments. The random-effects model was applied for two sets of comparisons, with conventional laparoscopic cholecystectomy as the reference treatment. Odds ratios, mean differences and 95 % confidence intervals were calculated. Twenty-three randomized trials encompassing 1737 patients were included. The use of curved instruments was associated with increased operative time (mean difference 32.53 min, 95 % CI 24.23–40.83) and higher odds for the use of an adjunct trocar (odds ratio 22.81, 95 % CI 16.69–28.94) compared to the use of linear instruments. Perioperative risks could not be comparatively assessed due to the low number of events. Single-incision laparoscopic cholecystectomy with curved instruments may be associated with an increased level of operative difficulty, as reflected by the need for auxiliary measures for exposure and increased operative time as compared to the use of linear instruments. Current instrumentation requires further improvement, tailored to the features of single-incision laparoscopic surgery (CRD42015015721). The online version of this article (doi: 10.1007/s00464-015-4283-x) contains supplementary material, which is available to authorized users. Stavros A. Antoniou, Salvador Morales-Conde, George A. Antoniou, Rudolph Pointner and Frank-Alexander Granderath have no competing interests.